In the world of cosmetics, it has traditionally been seen that skin quality can only be enhanced by the topical application of various creams, serums, cleansers and exfoliators. However, the concept of "beauty from within" has started to gain popularity. This concept rests on the basic principle that we can enhance our skin quality via the foods and supplements we ingest. There is some very solid science behind this, and in our opinion, key supplements can play a very significant support role in overall skin health. There are a few main players when it comes to enhancing skin health from within, and most of them operate by regulating damage to our skin; something which is far harder to do via topical application. In fact, three of the main threats to our skin quality are oxidation, inflammation, and impaired blood flow. One of the best skin care strategies to improving skin quality is to limit the effects of oxidative stress within our skin. One of the main sources of oxidative stress in our skin is the sun. UV rays from the sun primarily exist as UVA and UVB. UVB does not penetrate the skin very deep, but UVA can. Due to this, UVA rays can be a significant cause for concern when it comes to our skin health. When the photons from sunlight penetrate the skin, they get absorbed by our bodies own “sunscreen”, which consists of photo absorbing compounds such as urocanic acid and melanin.These photo absorbing compounds, as the name may have already given away, absorb photons that have penetrated into our skin. When these compounds absorb photons, it causes them to get excited, which elevates them to a singlet excited state. This is usually followed by the photo absorbers returning to their ground state as they give off heat and light. Through this process, the photo absorbers have protected us from the potentially harmful effect of UVA rays. However, through an intersystem crossing, the singlet excited state photo absorbers can also be elevated to a triplet excited state. Once the photo absorbers have reached a triplet excited state, they can start to interact with molecular oxygen. The interaction of triplet excited state photo absorbers with molecular oxygen causes a rapid generation of reactive oxygen species (ROS), such as superoxide and hydrogen peroxide, which then in turn can induce oxidative stress. So why does oxidative stress matter to skin health? One of the main detrimental effects of oxidative stress in our skin is that it can interfere with healthy collagen synthesis. Collagen is a protein which exists in large quantities in the dermis portion of the skin. The dermis sits directly underneath visible skin, called the epidermis. One of the main functions of the dermis is to serve as a support system for the epidermis by providing strength and elasticity. The main way this is achieved is by complex interwoven strands of collagen which come together to form a net. This collagen net is then attached to the epidermis through a junction called the dermal-epidermal junction. The collagen net can attach itself to the dermal-epidermal junction through the use of various different forms of collagen. When collagen synthesis decreases, and the collagen net in our dermis starts to collapse, the epidermis can lose support and elasticity. As you may have guessed already, this can then cause the formation of wrinkles, while also producing a general reduction in visible skin quality. So far, we have discussed the impact UVA and UVB can have on skin quality via the effects they can have in the dermis. However, we have not talked about another component of sunshine which is infrared radiation (IRA). IRA can also penetrate through the epidermis and into the dermis where it can interact with dermal fibroblasts. Dermal fibroblasts are cells which play a major role in the upkeep of both the dermis and epidermis. Dermal fibroblasts produce various connective tissues - mainly by synthesizing collagen. These connective tissues help make up the extracellular matrix (ECM) which is a network of collagen, enzymes, and glycoproteins which act as support structures. In particular, it gives epidermal cells something to anchor too, and thus, the ECM is highly important in the formation of the epidermis. IRA can interfere with these dermal fibroblasts by both causing the mitochondria of the fibroblasts to leak reactive oxygen species and by inducing an enzyme called matrix metalloproteinase-1 (MMP-1). MMP-1 has the ability to break down collagen, and specifically, it can break down and damage the ECM. This causes an overall reduction in skin quality. It is also important to protect against IRA. This can also be achieved with oxidation regulating compounds, in particular, compounds which target mitochondrial oxidative stress. Overall, it appears that if we want to keep our skin looking healthy and vibrant, we need to ensure that oxidative stress is under control and that collagen synthesis remains intact. There are various ways by which this can be supported. The most straightforward of which is to simply avoid damaging variables such as excessive sun exposure. This is difficult for many, as a tan can make our skin look healthy and vibrant. We also need UVA exposure to synthesize vitamin D, an important vitamin in our bodies which modulates a large amount of bodily functions. Based on this, completely avoiding the sun, or lathering yourself in very high SPF sunscreen, is not always the best option. It is generally recommended by experts to keep sun exposure to a minimum (try to avoid long tanning sessions) and to use a moisturizer that includes a low SPF sunscreen. In addition to this very simple strategy, you may also like to consider a smart supplement regimen that specifically targets the support of collagen synthesis and overall skin health. There are quite a lot of supplements which can achieve some of these effects, but not all supplements can offer full spectrum protection. The following list of dietary supplements, either alone or in combination with each other, may provide some of the most comprehensive oral skin protection to help keep your skin looking young and healthy for years to come! You may already be familiar with Sensoril, a highly potent ashwagandha extract, as we have previously talked about it in a few different blogs. However, you may be surprised to see it in a skin care article as it is normally known for its stress support and calming effects. However, what often gets brushed over when it comes to ashwagandha is that it is actually a very comprehensive oxidation regulating supplement. Ashwagandha appears to reduce levels of a major oxidative stress marker called malondialdehyde (MDA). When oxidative stress levels are high in the body, this is often correlated with a sharp increase in MDA levels, which means that a reduction in MDA levels can often be correlated with an overall decrease in oxidative stress. More specifically, ashwagandha can regulate the levels of two of the main reactive oxygen species in the body: hydrogen peroxide and super oxide. Interestingly, these reactive oxygen species also appear to be among the most potentially damaging to collagen integrity and synthesis. In other words, by supplementing with Sensoril, the negative effects of oxidative stress on skin health may be minimized. Furthermore, and this is likely no surprise, stress can have a majorly detrimental effect on overall skin quality. One of the reasons for this is actually because elevated stress hormone levels, such as cortisol, can break down collagen proteins in the dermis. When these collagen proteins get broken down during times of elevated stress, our skin can lose some of its elasticity which can result in a dull look to our skin. Over time, elevated stress may also contribute to the formation of wrinkles, as collagen is necessary to keep the skin firm and free of wrinkles. Luckily, ashwagandha does a fantastic job of not only reducing the subjective effects of stress, but it also helps regulate stress hormone levels. By regulating stress hormone levels, Sensoril can help aid the bodies natural recovery processes and can help prevent degradation of our skin quality. As an added bonus, stress hormones can also degrade the quality of our hair and it appears that by reducing cortisol levels, Sensoril can help keep our hair healthy and full. 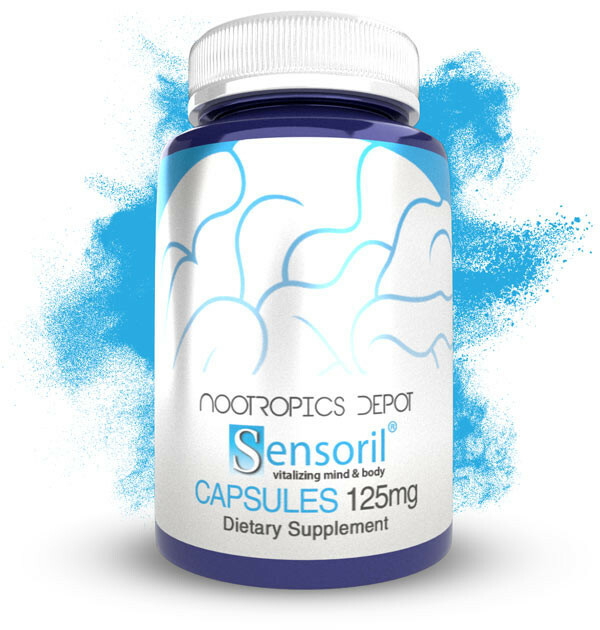 Additionally, Sensoril may also help promote healthy inflammatory responses throughout the body. This can also be majorly beneficial to overall skin quality as low level inflammation of the skin can result in a reddish color to our skin. Regulating this low level inflammation by supplementing with Sensoril may help improve overall skin tone and smoothness. Overall, Sensoril has many skin health benefits and definitely represents the concept of "beauty from within" very well. Since Sensoril has many beneficial effects beyond promoting skin quality, it would be a fantastic supplement to consider including in your daily skin care routine! This is another supplement some of you may also be familiar with due to our blog about shilajit. Interestingly enough, it is also made by Natreon, the same company that makes Sensoril! Similar to Sensoril, Primavie shilajit has some significant oxidation regulating effects which can be majorly beneficial to overall skin health. However, unlike Sensoril, most of the oxidation regulating effects of Primavie Shilajit appear to be focused within the mitochondria of cells. As discussed earlier, targeted mitochondrial oxidation regulating compounds can help promote dermal fibroblast health, and by doing this, can help enhance both dermal and epidermal health. Extrapolating from this, Primavie shilajit may help prevent the IRA mediated induction of MMP-1, and through this mechanism, may prevent unnecessary breakdown of collagen and degradation of the ECM. This will ultimately be of great benefit to overall skin health! Collagen type I: The most represented type of collagen in our skin, which accounts for about 70% of the total collagen present throughout our skin. Collagen type I forms large collagen fibres which crosslink to form a net. This net of collagen is mainly what gives structure and firmness to our skin. Collagen type III: This is the second most highly represented type of collagen and makes up about 10% of the total collagen present throughout our skin. Collagen type III is highly important in supporting the role of collagen type I in the skin. This is due to the fact that collagen type III is required for the formation of fibrils in collagen fibers which make up the ECM. Increased levels of collagen type III may even help support the body's natural wound healing process! Collagen type V: This type of collagen is present in much smaller quantities in the skin, but nonetheless, plays an important role. It appears to make up part of the dermal-epidermal junction which we talked about earlier. Collagen Type V also allows various collagen fibers to connect to each other and appears to help strengthen our skin. Collagen type VI: This type of collagen is also present in much smaller quantities in the skin and appears to interact with collagen type V to help with collagen fibre cohesion. Tenascin X: Tenascin X helps to organize collagen fibrils in the ECM and plays a major role in maintaining the elasticity of our skin. Decorin: Decorin helps organize the overall collagen matrix, in particular it helps with the spacing between collagen fibrils. This helps keep our skin strong and elastic. Interestingly, UV radiation appears to interfere with the ratio of decorin to collagen and thus, enhanced decorin expression may help protect against the harmful effects of UV radiation on skin health. Elastin: As the name may suggest, elastin plays an important role in the elasticity of our skin. In particular, it allows our skin to stretch and contract, and return to its normal state after the contraction or stretching has occurred. Fibrillin: Fibrilin helps support the function of elastin, and thereby, also enhances the elasticity of our skin. Fibronectin: Fibronectin is a crucial component in the process of wound healing. It helps shuttle collagen to injury sites, where it then deposits the collagen. Fibronectin appears to preferably bind to type III collagen. Overall, it appears that Primavie shilajit has some remarkable effects on overall skin health, and may even support the body's natural wound healing process. In combination with all of the other beneficial health effects, Primavie would be a solid choice for supporting overall skin health! 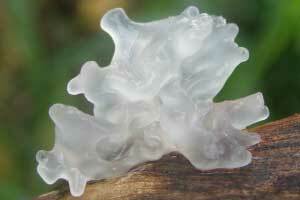 Tremella fuciformis mushroom, also known as White Jelly mushroom, is a popular supplement for skin care. However, white jelly mushroom is often times only used topically. This is due to the fact that the Tremella mushroom can hold many times its own weight in water. By applying the mushroom topically to the skin, we can help bring moisture into our skin; which will help keep our skin looking firm and healthy. However, this remarkable mushroom does not necessarily need to be applied topically in order to reap its skin health benefits, as it has some significant skin health boosting effects when taken orally. As we discussed earlier, one of the biggest threats to overall skin health is oxidative stress, which can be induced via various different pathways. The effects of oxidative stress may hamper many regenerative processes in the skin and one of the main targets for this oxidation are our skin fibroblasts. These skin fibroblasts appear to be particularly sensitive to hydrogen peroxide (which occurs naturally in our body). White jelly mushroom appears to attenuate the oxidative damage that can be inflicted upon skin fibroblasts by hydrogen peroxide, and by regulating this damage, white jelly mushroom can help promote healthy collagen levels in our skin. As mentioned earlier, this is due to the fact that damage to skin fibroblasts may induce expression of an enzyme called MMP-1 which plays a pivotal role in the degradation of healthy collagen levels. Furthermore, skin fibroblasts play an important role in collagen synthesis, and general upkeep of our ECM. 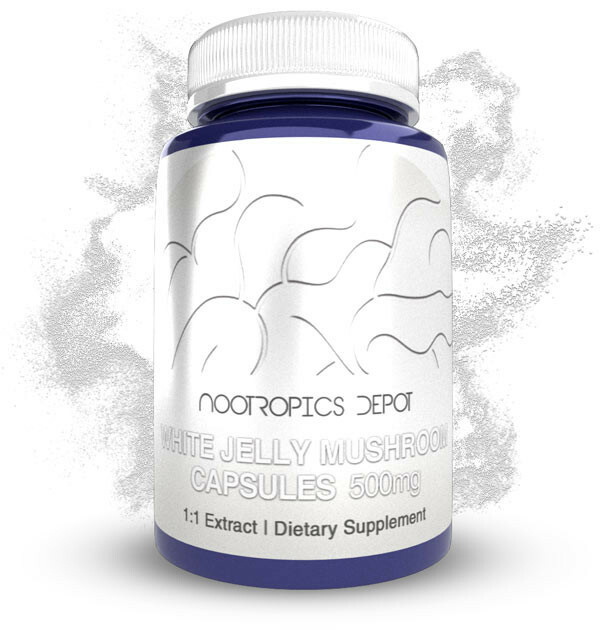 White Jelly mushrooms appear to exert these beneficial skin health effects by supporting the expression of Sirtuin 1, or SIRT1. SIRT1 is an enzyme which can exert beneficial effects on many different cells throughout the body. In particular, it appears that SIRT1 is highly expressed in skin fibroblasts, which indicates that SIRT1 likely plays an important role in maintaining overall skin health. Research has shown that, through activation of SIRT1, White Jelly mushroom can help protect our skin from oxidative damage induced by reactive oxygen species such as hydrogen peroxide. SIRT1 levels appear to rapidly decrease as we age leaving us with a compromised skin protection system. However, since White Jelly mushroom can up-regulate and activate SIRT1, it may be a highly beneficial anti-aging mushroom for our skin! Centella asiatica, also known as Gotu Kola, is mostly known for its calming and cognition support effects. However, Gotu Kola also appears to have some powerful effects on skin health as some of its bioactive components, such as madecassoside and asiaticoside, have beneficial effects on collagen synthesis. As we talked about earlier in the section about Primavie Shilajit, type I and type III collagen are the most abundant collagens in our skin, and the bioactives in Gotu Kola appear to significantly boost the synthesis of these two collagens. In particular, madecassoside appears to have the most potent effects on collagen synthesis, which is also one of the main bioactive compounds in our enteric coated Gotu Kola extract tablets. 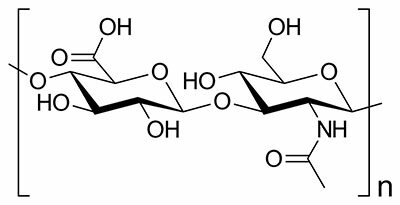 This is also where our enteric coating comes into play, as normally madecassoside is rapidly broken down in stomach acid to madecassic acid. The same is true for asiaticoside, which is rapidly broken down into asiatic acid. By enteric coating our Gotu Kola Extract tablets, we can circumvent this breakdown and prevent madecassoside and asiaticoside from breaking down into madecassic acid and asiatic acid in the stomach. This is significant, as it appears that only madecassoside and asiaticoside can support collagen synthesis, and that madecassic acid and asiatic acid do not have any effects on collagen synthesis. This means that as far as we are aware, our enteric coated Gotu Kola extract tablets are the only oral Gotu Kola supplement on the market that can enhance collagen synthesis! We are very excited to finally be able to offer enteric coated options, and will be expanding our products using that technology as time goes on! Furthermore, it also appears that Gotu Kola Extract selectively enhances collagen synthesis, and thereby can prevent the excessive amount of collagen synthesis that occurs during the body's natural wound healing process. This is significant, as highly increased collagen synthesis can contribute to the formation of scar tissue. Gotu kola may also help inhibit various enzymes that can degrade skin quality. We have already spoken about one of these enzymes, and that enzyme is Matrix Metalloproteinase-1, or MMP-1. MMP-1 is an enzyme that has the ability to degrade collagen. Thus, by inhibiting the activity of MMP-1, gotu kola can help preserve collagen levels in the skin. Gotu kola also appears to inhibit hyaluronidase, an enzyme that is largely responsible for breaking down hyaluronic acid. Hyaluronic acid is a unique compound that is highly expressed throughout our skin. In fact, it has a multitude of effects in our skin with one of the main effects being that it is able to draw moisture into our skin. This is important as it allows our skin to stay hydrated which can help keep our skin firm and looking healthy. Hyaluronic acid also plays a major role in our body's natural wound healing process, and thus is an important factor for maintaining overall skin health. Hyaluronic acid production is also affected by UVB radiation, which can significantly slow down hyaluronic acid production. Yet another reason why we should protect our skin from the sun! By slowing down the breakdown of hyaluronic acid, gotu kola may help maintain skin health and protect us from the sun! Furthermore, gotu kola also appears to be able to inhibit yet another enzyme called elastase. As the name may have already given away, elastase is mainly responsible for breaking down elastin. We talked about elastin briefly in the previous section about Primavie shilajit, where we concluded that elastin plays a major role in the maintenance of elasticity in our skin. Thus, by reducing the breakdown of elastin, gotu kola may help maintain the elasticity of our skin. Overall, it appears that Gotu Kola can be highly beneficial for both maintaining and enhancing skin quality. Combined with the fact that it can have significant calming and cognition supporting effects, supplementing with Gotu Kola extract could be highly beneficial for many different purposes! Our final skin health supplement for your consideration is one that most of us are more than likely very familiar with: green tea! For this last skin health supplement, we are going to switch gears a little bit. 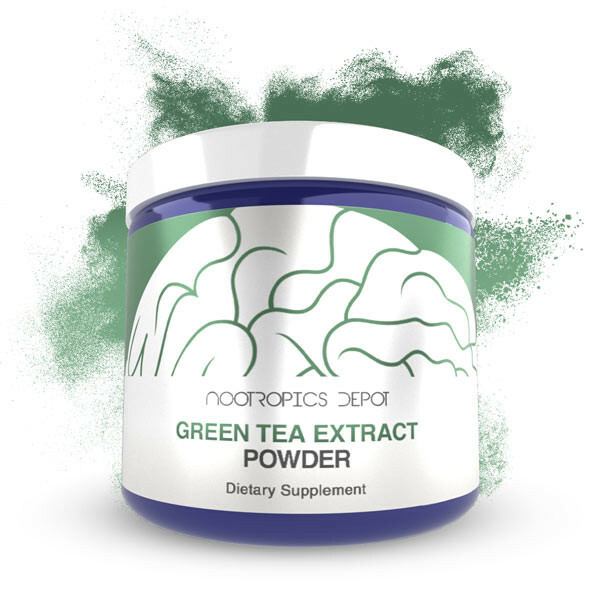 Green tea extract is well known for its oxidation regulating effects, so as you now know, it is going to help protect our skin by regulating the harmful effects of oxidative damage to our skin. However, we already have a good number of highly competent oxidation regulating extracts in this blog, so that is not what we are going to primarily discuss regarding green tea extract. In fact, green tea extract doesn’t appear to really help much at all with maintaining skin firmness and elasticity. Instead, it may help fight off one the most dreaded threats to our skin! You know what we’re talking about, you wake up, you look in the mirror (and gasp!)... what do you see there? A tiny little red spot? Yes, that’s right... you’ve got some acne! No matter how great your skin looks, acne can really put a damper on your confidence levels. There are two main pathways by which acne can form. The first is through the accumulation of the lipids squalene and wax esters in sebum glands. Sebum glands continuously produce these lipids through a process called lipogenesis, and when sebum production ramps up and there is nowhere for the excess lipids to go, there is a chance that these excess lipids can form acne. The second pathway by which acne can form, is out of control proliferation of a bacteria called propionibacterium acnes (P. Acnes) P. Acnes predominantly exists deep within our hair follicles and pores, where it feeds and thrives on sebum and various cellular byproducts. The more sebum you feed P. Acnes, the faster it will grow, especially if you lock it in. This happens when pores or hair follicles get blocked by the build up of materials such as sebum which then can enable P. Acnes to grow out of control. When P. Acnes grows out of control, it can cause large amounts of inflammation and cellular damage, which then results in acne. This is why acne often looks red and inflamed. Green Tea Extract, which is high in a polyphenol called EGCG, can quite effectively combat the formation of acne through a few different pathways. The first of which is to inhibit lipogenesis in sebum glands, which EGCG can achieve by inhibiting the function of sterol regulatory element-binding protein 1 (SREBP-1). SREBP-1 can take carbohydrates, such as glucose, and turn them into fatty acids. SREBP-1 is one of the main ways by which sebum glands can produce sebum, thus, by inhibiting the function of SREBP-1, EGCG can quite effectively halt the generation of sebum, which should then translate to a reduction in acne. Furthermore, EGCG has also been shown to slow down the growth of P. Acnes, so not only are we reducing the availability of one of its main food sources (sebum), EGCG also directly gets in the way of P. Acnes. As the cherry on top, Green Tea Extract also has significant inflammation regulating effects, which can help ease acne discomfort. Overall, Green Tea Extract appears to be highly beneficial for individuals who have occasional minor acne and would like to regulate the occurrence of those small, annoying, and sometimes painful zits. It is important to note that while green tea extract alone will likely not be the most beneficial product to take for overall skin health, it would certainly be a great add-on to some of the other skin health supplements on this list if you experience minor amounts of acne. In theory, all of the products in this list can also be incorporated into topical skin care routines as a lot of their oral effects will also extend to topical use. All of Nootropics Depot's products are extensively lab tested and have only been handled in clean-room environments, so incorporation into existing skin care products could definitely be a viable option. Many of the studies we have seen that incorporated these skin health supplements into skincare products used concentrations of around 3-5%. We would recommend starting with a skincare product you are already familiar with and respond well to, and then adding about 3-5% of any given skin health supplement to that skin care product. For example, for Green Tea Extract, if you had a 1 oz (28 grams) jar of facial cream, then you would want to add between 840-1,400 mg of Green Tea extract. We would advise to stick with Gotu Kola extract, Tremella fuciformis extract, and Green Tea extract if you wanted to try any of these skin health supplements out topically. The reason we advise against using Sensoril and Primavie for topical administration is due to their strong smells and dark colors. You can view all Nootropics Depot's powdered skin health supplements by clicking here. As always, when it comes to topical skin care, make sure to do a small patch test on an area of your skin that is not directly visible. This is highly-advised as skin reactions can vary widely from person to person. 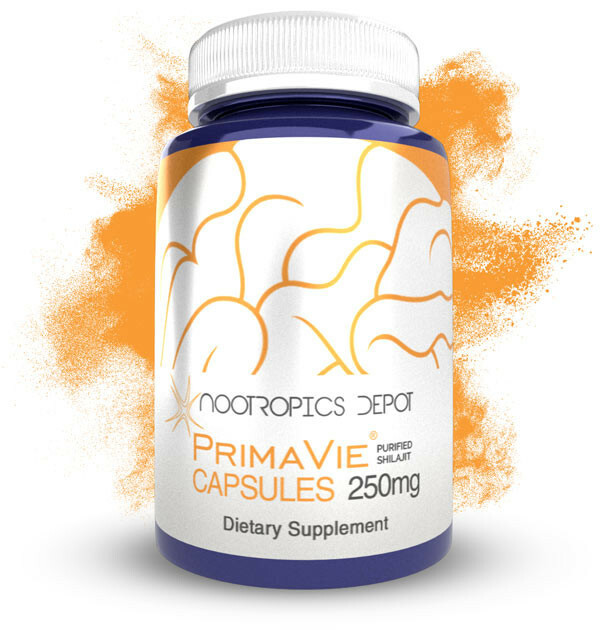 Nootropics Depot offers a variety of high quality supplements to support collagen synthesis and skin health. Click here to browse all of our skin health supplements.